Whitby Abbey was founded in 657 AD by the Saxon King of Northumbria, Oswy (Oswiu) as Streanshalh (Streonshalh). The name Streoneshalh is thought to signify Fort Bay or Tower Bay in reference to a supposed Roman settlement or Roman Signal Station that previously existed on the site. 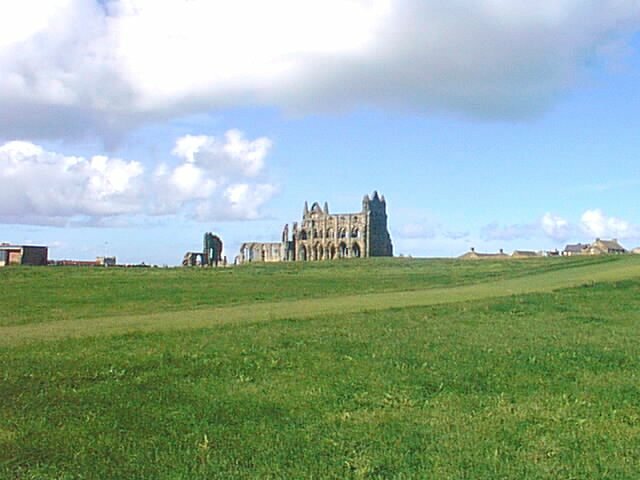 He appointed Lady Hilda, niece of Edwin, the first christian king of Northumbria, as Abbess of Whitby Abbey. The double monastery of Benedictine monks and nuns was also home to the great Saxon poet Caedmon. In 664, the abbey, built on the east cliff overlooking the Esk and town of Whitby, was the site of the Synod of Whitby, at which the Northumbrian Celtic church was reconciled to Rome. In 867, Whitby Abbey fell to Viking attack, and was abandoned until 1078, when it was re-founded by Regenfrith (Reinferd) a soldier monk, under the orders of his protector, the Norman, William de Percy. The second monastery lasted until it was destroyed by Henry VIII in 1540. The abbey buildings fell into ruins, and were mined for stone, but remained a prominent landmark for sailors.